Strategic Management is gaining importance in the curricula of management, business and commerce courses in Indian universities and institutes year after year. In conventional course structure of commerce, it is yet to establish its relevance at a national level. 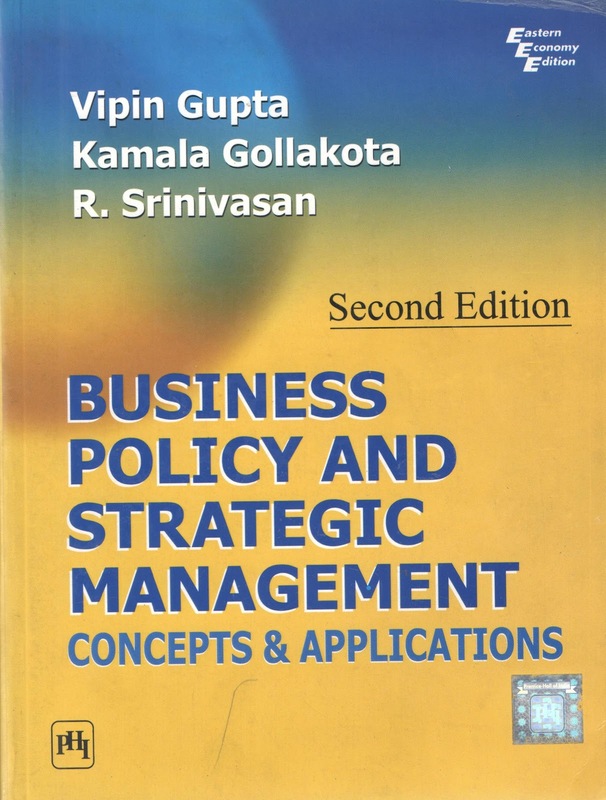 However, as micro level studies of different businesses are finding place in research domain, strategic management has become an important reading for the students of business and commerce. 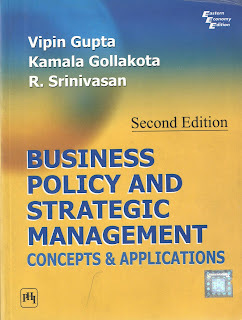 Strategy is a must read for the management students and the available literature on strategic management in India has not yet been able to relate indian cases with its theory convincingly and successfully. This book has come at the right time when a systematic study of the theoretical framework and related indian cases are lacking in the strategic management text. The book has three sections viz., Business Strategy, Corporate Strategy and Enterprise Policy. These sections cover 21 chapters, 7 in each section. In the process of equally dividing the chapters within sections, the authors have not been convincing on putting certain chapters under certain section. How corporate governance and ethics, change management, strategic control and strategic decision making fall under Enterprise Policy, one may not be able to follow. The presentation of the book as a text is excellent and the course students of strategic management would find it easy to use and understand. Every chapter of the book starts with an introduction as a heading; even without using this heading it could have conveyed the intention. Some of the chapters have conclusions towards the end, which sounds more like a research paper, which it is not. Further, the chapters starts with learning objectives and a summary is put towards the end of each chapter followed by key terms, concept review questions, practice exercises, case study, discussion questions and references. This structure should be appreciated by the readers. The authors have attempted to present the book in a more student friendly environment. The book follows headings and bullets format which makes it a ready capsule for students but somewhere looses scholarly approach. The cases on Quest International, Burns Philip, Crompton Greaves, Doordarshan, E-Sewa, IIM-B, Infosys, Lucky Goldstar Electronics, MIRC Electronics, Meddirect, Mumbai Dabbawala, NABARD and Grameen Bank, NTPC, Napster, Mahindra & Mahindra, Pepsico India, Pratham, Tata Motors, Telecommunications Consultants India and Yakima-Olympia have been included in the book and the discussion questions make it more lively. The appendix of the book at the end, is very well placed concentrating on simulated marketplace, usually it has not been attempted by many other authors writing on strategic management. The gray shaded boxes in different chapters could have been made on a little lighter background to make it easily readable without any strain. The discussion on the development of strategy thought has been avoided by authors which could have been put in the beginning. Indian industry database should have been incorporated wherever relevant to address the Indian students. The authors should have put a company and people index towards the end to provide better value to the readers. Overall the readers would find this book contemporary and practical in its approach. The authors have been successful in linking the traditional framework with the modern structure through various cases. As readers we might have more expectations from the authors in the forthcoming editions of the book. The authors deserve congratulations for this successful venture. More so, when the first author is an alumni of SRCC, Delhi.